Allegro Madil is a bulky boucle yarn composed of 85% wool and 15% nylon with 82 yards per 50 gram ball. The color in this picture is a bit brighter than the skein I have in front of me. I’d describe it as a lime green with flecks of grape and deep mauve. Please don’t hold me to those color names. Color is not my forte! Suffice it to say that this yarn is about the color of the skin of a lime with flecks of two purplish colors. Good enough??? 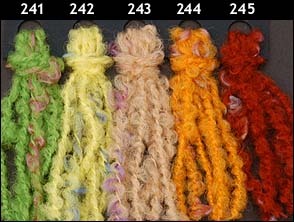 Do you crochet with wool or wool blend yarns? If so, why? If not, why not? I know lots of people have allergies. I’m looking for answers other than that, although that’s certainly a legitimate answer. Each item will be mailed to the winner by USPS – books by media mail. For now, this contest will only be open to participants with a U.S. mailing address. This is how it will work. Each Monday, I’ll pose a question on my blog. Everyone who answers the questions will be entered in the drawing on the last day of that month. Some ‘answers’ may require you to post a link to a specific pattern or site. The winner will be announced along with the next Monday’s question. The winner will have 48 hours to contact me with mailing information. If the winner doesn’t contact me, the prize will be offered on another occasion. RESPONSES MUST BE POSTED HERE AND NOT EMAILED TO ME PRIVATELY OR POSTED ELSEWHERE FOR ENTRY. TO MAKE IT CRYSTAL CLEAR, THE WINNER WILL BE ANNOUNCED ON THE LAST FRIDAY OF EACH MONTH AND THE WINNER MUST EMAIL ME (crochet@craftgossip.com) WITHIN 48 HOURS OF THE ANNOUNCEMENT. So, for sanity’s sake, that deadline will really mean that I need to hear from you no later than 8 PM the following Monday (so you have plenty of time to email me and I’ll get the email for sure even if I don’t sign on to my email on a Sunday). Simply enter to win by leaving a comment on this post answering the question posed. I use wool and woolblends because they hold up to the wear my men give them. They also breathe better than acrylics. I’m still sort of new to crochet, so I’ve just been using whatever feels good to the touch. I use wool and wool blends a lot. I think they feel better to the touch than a lot of synthetic yarn. I end up making a lot of wool things for myself and my family. When I’m making gifts for others though, I take into consideration whether I think the person is going to be willing to hand wash their items. If the answer is no, then I make it from something synthetic. I love wool and wool blends. They’re soft and there’s something about the way that the yarn soaks up the color when it’s dyed that really appeals to me. I love merino wool the most. Of course, as already mentioned here, the drawback is that washing isn’t as simple with wool. For that reason, I often use it for scarves and jewelry and make bigger pieces with other yarns. What a fabulous yarn! I crochet for tots and toddlers. The product has to be soft, washable and shrink resistant for busy moms. Here is an easy to care for yarn that will give me the warmth of wool and the easy care of blends. I’m looking forward to seeing in the stores around me. The wool I use depends on the project that I am making. Spun or unspun, wool or synthetics or blends, naturally dyed or chemically or left in it’s natural state, and then there is sheep, lamb, goat, rabbit, llama and alpaca to choose from as well. I am lucky enough to have access to it all from both local sources as well as big box stores. I knit, crochet, weave, hook rugs and felt as well so it really really depends on the project as to what kind of fibre gets used in it. The people I gift things too have input as to what they want against their skin, and what they want. I haven’t used many wool yarns up to this point because of the washing, I like easy to care for items! I use wool and wool blends, I prefer a more natural yarn. If I am making things that will require infrequent washing, like scarves or hats, I prefer the wool yarns for softness of feel. if what I am making is for babies/children then it is always synthetics because I want people to really use the items I make for them. If I am using yarns for non-wearable fun type items I will go for whatever looks really cool and funky. I have never met a yarn I haven’t found a use for. They even find their way into my hooked rugs! I have made a sweater or two with wool, and I crocheted an afghan with wool. I love wool because it has a beautiful finish and looks rich. I will work with wool and wool blends if it’s a special order. The richness of wool colors seem to have greater depth BUT for ease of care and skin sensitivities, when I make an item for sale it is not usually wool. That said, I love to felt so I do use it then. I like to crochet with a wool blend yarn, the ending result looks better to me, more professional. However, if I was working on a project that requires felting, I would use the 100% wool, or if I wanted something warmer to wear. I haven’t really used wool before but I would love to! It looks so soft and who wouldn’t love a fluffy wool scarf? I don’t use wool at all when I am crocheting. I live in Texas and it usually is too hot to work with wool. I choose yarn based on color and texture most of the time. I love natural fibers and blends and recycling yarn that I score at yard sales and thrift stores. Felting is a new fascination of mine and that is all about wool! I first used a wool yarn to make a hat for a friend, and was surprised by how soft it was. I haven’t done a lot in wool – they’re scratchier than other fibers I like to use. On the other hand, I love felting – so that’s incentive to use wool. Wool and wool blends are something I aspire to using as my skills improve. I love the colors and textures. I’ve been crocheting for about two years, mostly afghans and a few hats. Still struggling with knitting needles. I’m a little afraid of the pricier yarns. Most of my stash is acquired at sales and consignments. I’d go to a finer yarn shop with a friend mostly to admire the quality and handiwork of more experienced crafters. I rarely use wool, as most of my items need to be easily washable and I can’t guarantee that people will be willing to handwash items. Most of my yarns and threads are thrifted so I get what I get and sort them by type and color—I like the look of wool (it has better color and stitch definition) but it’s not a big part of my stash or my work. I prefer wool, like others have said, because it breathes far better than acrylic. Even before I hit menopause I was not comfortable in clothes that didn’t let my skin breathe, and now that’s even more vital! I actually use whatever I can get my hands on. For kids I tend to stay away from wool, unless given permission by parents. I love wool blends best with washability. There are too many great yarns on the market not to try them all! I use wool and wool blends for scarves and hats. I don’t crochet with wool yarns, but that’s because I haven’t learned to crochet yet! I do, however, sometimes knit with wool blends.